ANN ARBOR, MI / ACCESSWIRE / May 23, 2017 / ENDRA Life Sciences Inc. ("ENDRA") (NASDAQ: NDRAU), a developer of photo- and thermo-acoustic medical technologies, has closed its previously announced initial public offering of 1,680,000 units, each consisting of one share of common stock and a warrant to purchase one share of common stock, at an offering price of $5.00 per unit. In connection with the initial public offering, the underwriters exercised their over-allotment option to purchase an additional 252,000 units at the initial public offering price, less than the underwriting discount, in full. As a result, the total initial public offering size was 1,932,000 units, and the gross proceeds from the initial public offering were approximately $9.7 million, before deducting underwriting discounts and estimated offering expenses. ENDRA's units began trading on the NASDAQ Capital Market under the ticker symbol "NDRAU" on May 9, 2017. ENDRA's common stock and warrants will trade together as units during the first 60 days following the date of the prospectus pursuant to which the offering was made (unless the underwriters' representative determines that an earlier date is acceptable) and, thereafter, the units will automatically separate and the common stock and warrants will trade separately. Following separation, each warrant will have an exercise price of $6.25 per share of common stock and will expire on the fifth anniversary of the original issuance date. Once the securities comprising the units begin separate trading, the shares of common stock and warrants are expected to be listed on the NASDAQ Capital Market under the symbols "NDRA" and "NDRAW," respectively. ENDRA expects to use the net proceeds from the offering to fund the development and regulatory approval and to prepare for the commercialization of its Non-Alcoholic Fatty Liver Disease Thermo-Acoustic Enhanced Ultrasound application in the European Union and for working capital and other general corporate purposes. National Securities Corporation, a wholly owned subsidiary of National Holdings, Inc. (NASDAQ: NHLD), acted as sole book-running manager for the offering. Dougherty & Company LLC acted as a qualified independent underwriter for the offering. A registration statement relating to these securities has been filed with the Securities and Exchange Commission (the "SEC") and was declared effective on May 8, 2017. A final prospectus relating to the offering has been filed with the SEC. Copies of the final prospectus relating to this offering may be obtained from: National Securities Corporation, Attention: Marguerite Rogers, 410 Park Avenue, 14th Floor, New York, New York 10022, or by email at prospectusrequest@nationalsecurities.com. This announcement shall not constitute an offer to sell or a solicitation of an offer to buy these securities, nor shall there be any offer or sale of these securities in any state or jurisdiction in which such an offer, solicitation or sale would be unlawful. 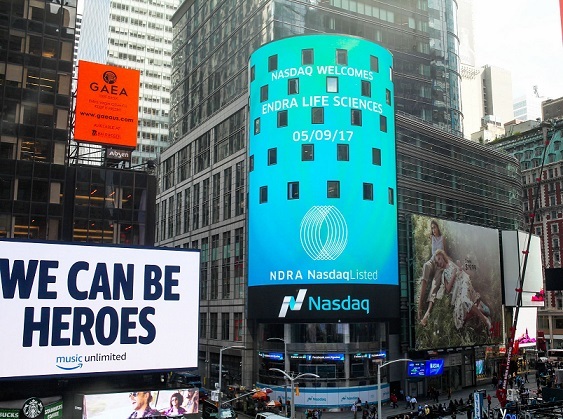 ENDRA Life Sciences Inc. ("ENDRA") (NASDAQ: NDRAU) is a developer of photo- and thermo-acoustic medical technologies bringing new capabilities to existing ultrasound systems. ENDRA's photo-acoustic solutions currently help global medical researchers screen and modify disease models with high image quality and volume scanning speed. ENDRA has a global installed base of leading institutions using the Nexus-128 system, the only commercially available 3D imaging system for imaging anatomy, physiology and labeled molecular targets. ENDRA's thermo-acoustic technology is being developed to enable clinicians to use their existing ultrasound equipment to visualize tissue function, composition, and monitor a variety of therapeutic interventions - at the point of care. This directly aligns with current healthcare trends to improve patient access, clinical effectiveness, safety and cost. For more information, please visit www.endrainc.com. Social media coverage on ENDRA's May 9, 2017 IPO can be found here on Twitter, here on Facebook, and here on LinkedIn.